(Bloomberg Opinion) -- It looks like Foxconn Technology Group is taking one for the team. In an earnings report filed overnight in Taiwan, data show a rise in inventory at a time when revenue was slowing, and sales at its major client, Apple Inc., dropped. This situation looks familiar. Inventory figures at Apple’s primary chipmaker Taiwan Semiconductor Manufacturing Co. were also high at the end of 2018, up 40 percent from a year earlier. At the time, TSMC Chief Financial Officer Lora Ho told me that stockpiles consisted primarily of raw wafers and 7-nanometer chips in production. In layman’s terms: the basic ingredient upon which chips are built, and semiconductors made with the latest technology. In the fourth quarter, Apple was the primary client for such technology. That revelation came soon after Apple cut its own outlook for the period, citing weaker demand. Impressively, the iPhone maker managed its inventory so well that the figure climbed a mere 12.8 percent at the end of December from a year earlier – one of the slowest clips in recent quarters, and in the face of falling sales. My conclusion in January was that, to avoid holding inventory, Apple was pushing it back onto suppliers. Ho declined to name the client, but she said that customers may ask TSMC to keep product on its shelves (and books) even if a chip has finished production and passed all required tests. Foxconn’s major subsidiary, Hon Hai Precision Industry Co., takes a long time to report its financials, which is why we didn’t get to view its year-end numbers until now. Maybe this delay diminishes the usefulness of this data, or the situation has improved during the interceding first quarter. 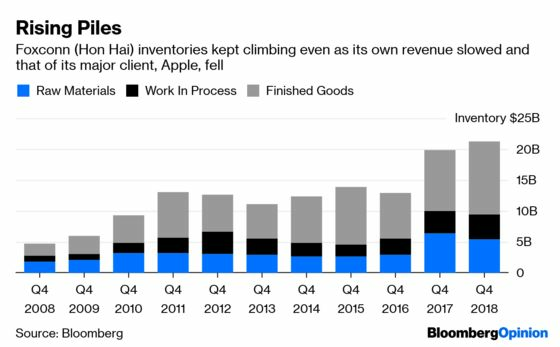 Nevertheless, these Hon Hai figures are further evidence of Apple’s inventory strategy. The Chinese government also looks to be inadvertently helping Apple trim its stockpiles. In March Beijing announced it would cut the value-added tax rate to help buoy the economy. Apple started passing those savings on to consumers, Caixing reported, citing data from e-commerce companies and Apple’s own China website. The company already lowered prices in February, but the levy cut allowed it to trim again with a minimal hit to margins. Over the past few months, suppliers throughout the hardware sector have spoken of moves to lower output in order to digest excess inventory. The result will be a particularly deep trough for the March-quarter cyclical low season. 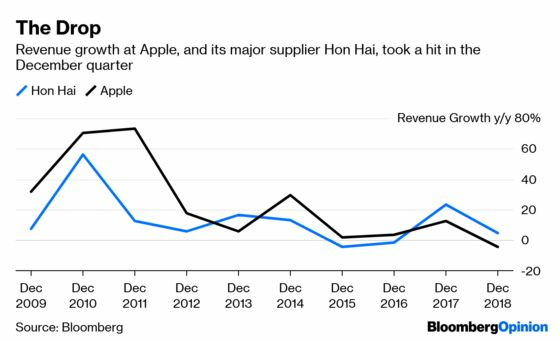 If Hon Hai’s figures are anything to go by, the first quarter is likely to be one of austerity, in the hope that taking one for Team Apple will be rewarded with a rebound later. Now all we need is for consumers to go back out and start buying gadgets again.